A Living Christmas Tree is a Tree for Life! Here's a simple way to green up your Christmas! Buy a real living Christmas tree - roots and all. Pot your Christmas tree up carefully, keep it in your home for 10 to 15 days and then plant it out in your garden for a year or two before bringing it in for another bit of festive cheer! Read on for how to select real Xmas trees - and how to care for them so that they will stand a chance of making an appearance in years to come! Ideally, look for an organic tree because the environmental costs of growing organically are far more sustainable. Don't buy a living Christmas tree which has been stored inside a heated garden centre as it is less likely to keep in good condition indoors for any length of time. Make sure that the needles are in good condition and are not already starting to drop in any quantity. Avoid Christmas trees with bare patches or poorly distributed branches. Buy a Christmas tree which looks bright and lively. There are several varieties of tree which may provide a beautiful living Christmas tree. Douglas Fir and Norway Spruce both do well as living Christmas trees. If you are looking for an excuse to buy something exotic for your garden and think that it could double up as a living Christmas tree, be careful to check that it is hardy enough to withstand temperature changes. 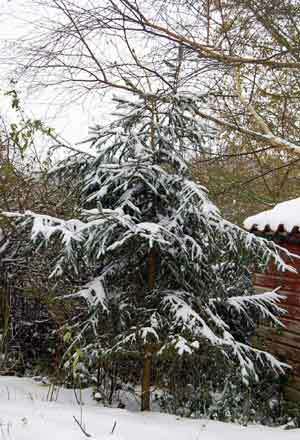 I used a small Thuja one year which didn't hold ornaments particularly well, but it looked nice and did very well in the garden afterwards. My children were too young to know the difference, at the time! If your new Christmas tree is in its own pot, then you need only make sure that it is well watered and that there is enough potting mix in the tub. If you have time and space, put it in a cool out-house for two or three days to bridge the gap between the chilly outside world and the warmth inside your home. This applies to the time before Christmas and after Christmas when you are getting ready to return it to the garden. 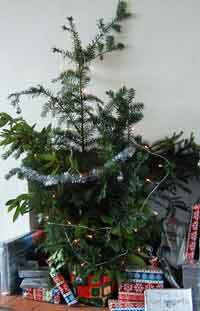 If you buy a Xmas tree with bare roots you will need to pot it up straight away. Make sure that the pot you choose is ample and has good drainage holes. Fill the bottom of the pot with a few old crocks to help excess water to drain away. Place the tree in the pot, tucking in any stray rootlets and carefully fill it with a good quality potting mixture. Tamp down the compost until the roots are securely supported and in contact with the soil. Water your living Christmas tree immediately and copiously and let it drain freely. Check that the tree is well bedded into the potting mix and put it out in a shed for a couple of days to acclimatise. Outdoor Christmas trees need no special treatment, provided that they have not been stood in the warm while waiting to be sold. If you are planning to display your Xmas tree outside, just make sure that the root ball is well seated in the pot and that the compost remains damp. Site it where it is unlikely to suffer wind damage or water-logging. Your living Christmas tree will stand a far greater chance of staying a living Christmas tree if you water it daily (OK, you might want to forget it on Christmas day...). It should be stood in the coolest part of your room or hallway (not next to a radiator or near a heat source). Place it in a deep tray or tub so that excess water (and soil) does not damage your flooring. Water all around the base of the tree trunk each time. Most trees will need at least a litre of water or more, depending on the size. Don't let your tree stand in a puddle of water for days. Keep all electric lights well away from any water. Where can you buy good Christmas trees? There do not seem to be many organic growers just yet. In Oregon (US) there is a new scheme for tagging Christmas trees to show their environmentally sustainable credentials. This is run by the Coalition of Environmentally Conscious Growers. If you live in the San Diego area (US) you can now order a tree and have it delivered by singing, dancing elves! They will even collect the tree afterwards and replant it in an area affected by the recent fires. (Or you can put it in your garden for next year) They supply lots of different sizes and types, even young giant sequoias! In Britain you can buy sustainably grown trees through the Forestry Commission. They have a list of outlets around Christmas time. All trees are FSC certified and for each tree harvested another is planted. They are not necessarily organic, though. Here's the list of Scottish Christmas tree sales centres. They also link to the English site. Church Farm Organics on the Wirral do organic trees. They seem to mainly supply cut trees, though. I've come across some interesting ideas for green Christmas trees, though. Christmas trees - the traditional spruce of the north - don't thrive in warm climates. One blog suggested using tumble weed for hanging Christmas decorations! There must be plenty of tropical trees and shrubs which do well inside for a week or two. Another family suggested using replanted trees; when they get too big they simply lop off the top to supply the home with a new Christmas tree (and at the same time prune the remaining tree in the ground!) That's one way to stop your tree outgrowing your garden. Many suitable Christmas tree varieties do tend to grow to a fairly massive size after a few years, so if you do opt for one of these don't plant it too close to your house or outbuildings. If you live in a fairly hot or Mediterranean climate, consider buying a Italian Stone Pine (Pinus pinea). They will tolerate a fair amount of heat and with a bit of luck you may even harvest pine nuts for years to come! This tree can become very large and is even considered invasive in some parts of the world - so do your research! It can manage to grow even as far north as Scotland. If your area is prone to drought or windy conditions maybe an Afghan Pine (Pinus eldarica) will be suitable. They also tolerate very hot weather. Afghan Pine are also known as Mondale Pine and as Eldar Pine. They grow to about 12 metres. I'm sure there are lots more creative ideas for greening your Christmas tree. One idea I like is to go into the woods and pick a selection of small branches, some evergreen, and then just arrange the branches in a display. Put them into a big heavy jug or tub, with a little water in the bottom. Just add glitter, tinsel, decorations, (perhaps some LED Christmas lights but keep electrics and water separate, of course!) and you've got yourself a fine and original Christmas display. I guess this counts as a kind of green, living Christmas tree! The carbon cost should be far lower than if you opt for an imported tree or one that has been grown hundreds of miles away. Picture above: Christmas branches, including Norway spruce and laurel - rather inexpertly decorated! What's wrong with non-organic trees? The main problem is the use of pesticides. A study in 2005 showed that workers in Oregon and North Carolina were at considerable risk from Organophosphates (OPs) such as Di-Syston-15G. OPs can cause a number of unpleasant and health-ruining effects from accidental exposure. The wider environment can suffer too. Pesticides cause pollution of water sources and nearby humans and animals can be affected by airborne sprays drifting to adjacent land and settlements. Tales of living Christmas trees! Here are some delightful stories involving Christmas trees. A Wish to Be a Christmas Tree A lovely story about a christmas tree who thought he was too old to be someone's Christmas tree. The Year of the Perfect Christmas Tree: An Appalachian Story A heart warming tale of a mother and daughter bringing home the town's Christmas tree against the odds. Beautiful illustrations of the mountains by moonlight. Magical. Ages 4 - 8. Why Christmas Trees Aren't Perfect This beautiful story looks set to become a modern classic. A true tale of the spirit of Christmas. Click here for some festive reading about Christmas trees!